bread cubes and walnuts, then press to submerge. Refrigerate and let soak at least 1 hour. Meanwhile, preheat oven to 350 and make sure the rack is positioned in the middle. Butter a 9 x 5-inch loaf pan. This pudding bakes in a water bath so it stays moist. Therefore, you will need a larger baking dish with enough room to accommodate the loaf pan and 3/4 inch of water. Do not add water yet. Set aside. Melt butter in large skillet over medium heat. Add apple slices and sauté until golden and partially softened (approximately 10 minutes). Sprinkle with remaining brown sugar and gently toss. Simmer until sugar dissolves into butter and becomes a light syrup. Remove from heat. Remove bread pudding mixture from refrigerator and add apple slices. Transfer mixture to prepared loaf pan. Spoon any remaining syrup from skillet on to the top. Place loaf pan into baking dish and add water to approximately 3/4 inch outside the loaf pan. Bake bread pudding until apples are browned, and a tester inserted into center of pudding comes out clean. About 1 hour. Remove from oven and let rest at room temperature. Dust a plate with cinnamon and serve pudding with a generous drizzle of salted caramel sauce. Sprinkle kosher salt atop. Serve warm or at room temperature. In a medium saucepan, combine sugar, water and corn syrup. Heat on medium until sugar is dissolved. This step can go very quickly, so do not leave it unattended. When the mixture starts to boil and turn golden brown, add butter, salt and vanilla. Lower heat and continue to simmer until the mixture turns brown, or dark caramel colored. Remove from heat and slowly add half and half while whisking. Once the sauce is smooth and the color is consistent, pour into a heat-proof measuring cup. The sauce will thicken as it cools. 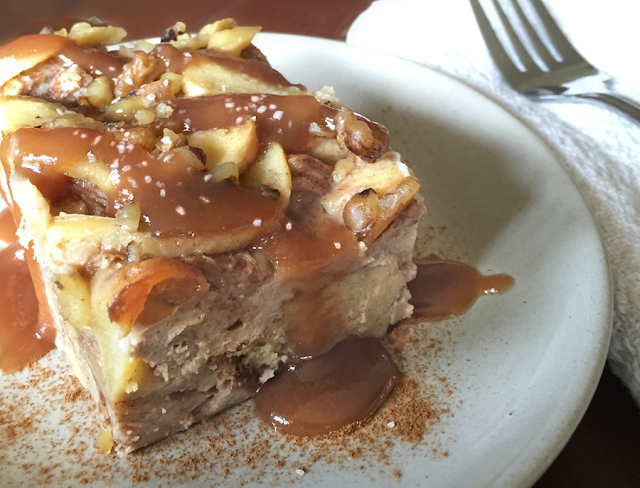 Do not refrigerate until after the bread pudding is served.